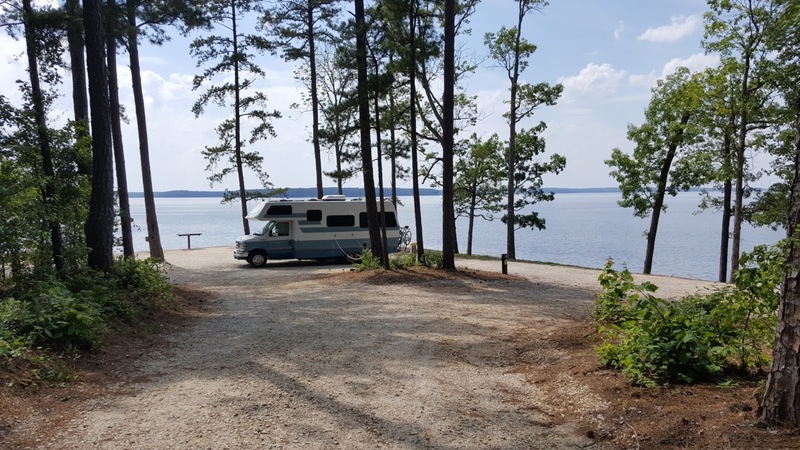 From Strom Thurmond Lake , Winfield Corps of Engineer Campground, it is a very short drive to Modoc COE Campground in South Carolina. 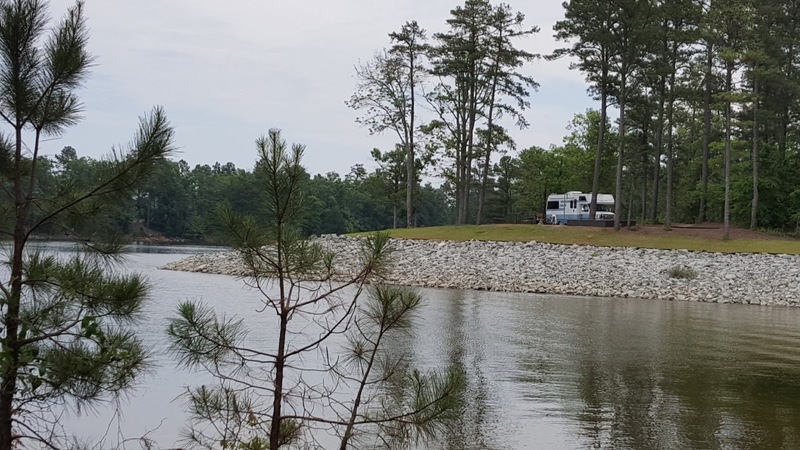 The wonderful part of these two Corps parks and Springfield COE and Coneross COE on Lake Hartwell is that most campsites are large( room for a large trailer or motorhome, a vehicle, maybe another vehicle, a tent or two, and more), and most are on the water. So many campers bring boats of all shapes and then anchor them right at their site. This is our site at Modoc COE. 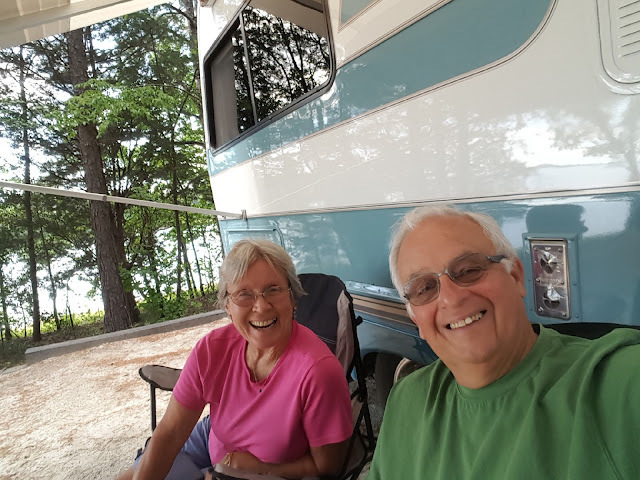 We think it is the nicest in the campground, #28. Besides the wonderful view, we face the sunset. The first night was cloudy, so we could only imagine. But, oh boy, this was the second night . A few fishing boats willingly obliged enhancing our picture. Thank you, folks. Site # 28 from across the inlet. In western South Carolina, much of our travel is on back roads in farm country. Occasionally you meet up with a large piece of farm equipment moving from one field to another. The drivers are very courteous though, and will pull over when possible to allow passing. That brings up another observation. When traveling on interstates, we see a good mix of various state license plates. But , when we travel on back roads, it is amazing how we can be in a state like Georgia and only see Georgia plates. 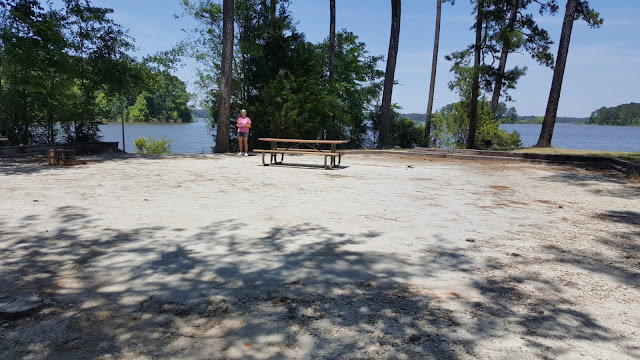 Then 10 miles east , entering South Carolina, suddenly there are only South Carolina plates on the roads and in the campgrounds. We call it "the license plate phenomena" It's like they will only travel and camp in their own state! Speaking of Georgia, we forgot this rainbow picture from Magnolia Springs. This one only lasted for a few short minutes. Jan and I had followed US 221 into South Carolina and then Route 28 north towards Anderson. This route follows Strom Thurmond Lake and the Savanna River north towards our next stop on Hartwell Lake. The river and lakes form the border between Georgia and South Carolina. If we followed the Savanna south we would pass by Savanna , Georgia and out to the Atlantic Ocean. Some of this weather was quite hot with temperatures in the 90's and the humidity just as high. But, Lady Blue provides good shade and inside air conditioning, so the old geezers just keep smiling! From Springfield, we follow Route 28 to Route 29 west out of Anderson and then Route 187 north to Route 24. 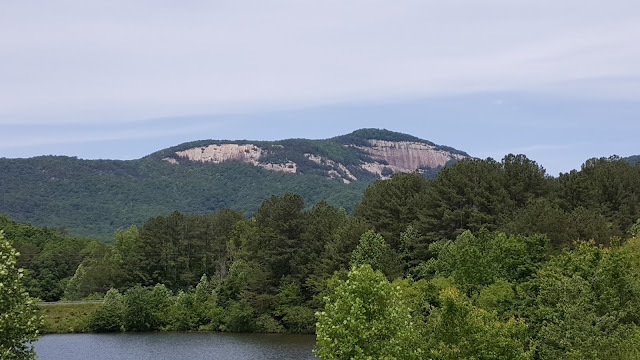 This crosses Interstate 85 and takes us to Townville and Coneross COE Campground. From here we begin to see the Smoky Mountains rising up in North Carolina. 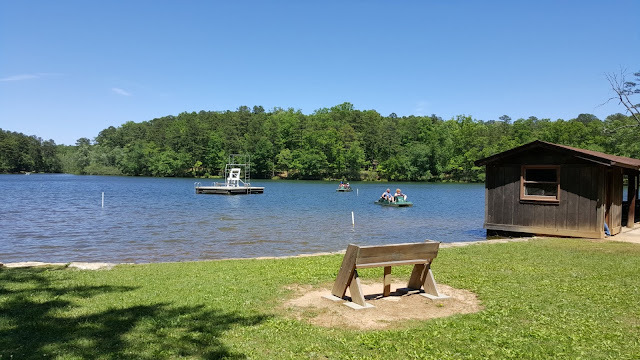 Route 24 takes us to Route 11 and Oconee State Park. This is close to the border of South Carolina, Georgia, and North Carolina. How many remember seeing or using one of these? We had some gas pumps like these around Massachusetts in the 1950's, but they were quickly disappearing. 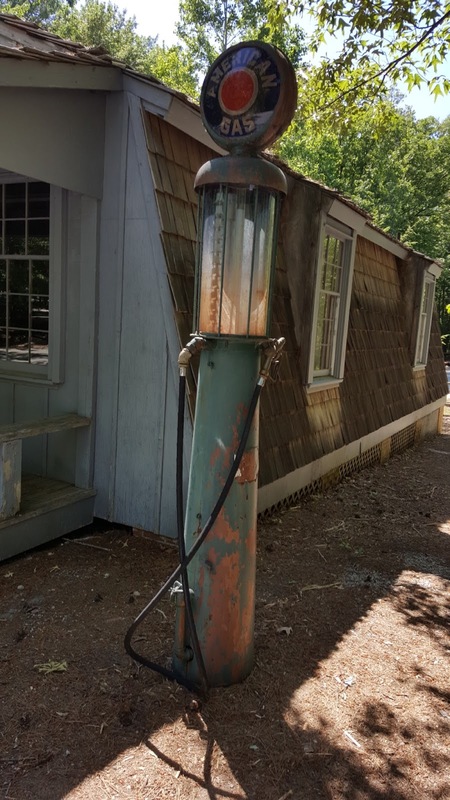 Depending on the pump, you would crank a handle to bring gas into the see through area, where markings indicated gallon measurements. Then that amount could be released via the hose into your gas tank. Of course, there was probably a gas station attendant to do this for you, as well as clean your windshield and check your oil. quite impressive in many cases. 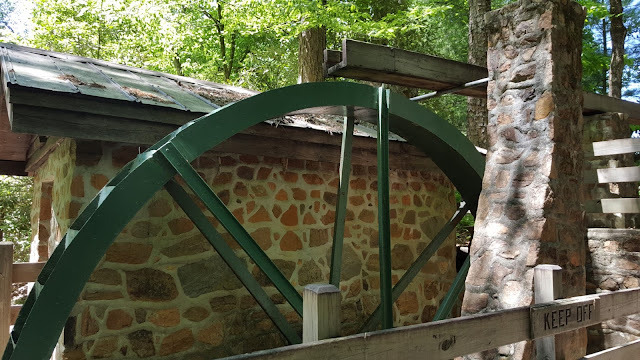 This is a water wheel that was used to move water up into the camp via a hydraulic ram pump, an ingenious device that used gravity to move water uphill before electric pumps. They would also attach saws and other machinery to the wheel using belts and gears. No power boats are allowed on this lake, but you can rent pedal boats. 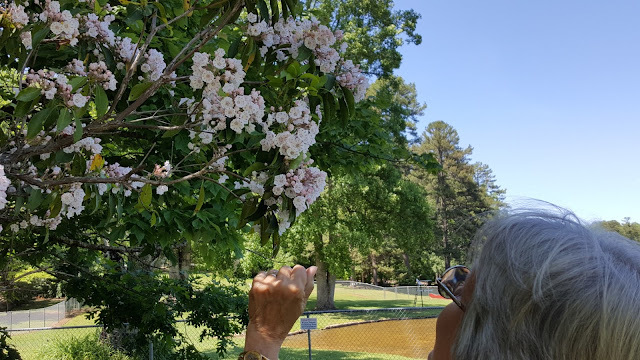 Jan is enjoying the beautiful mountain laurel in bloom around the lake. We haven't seen mountain laurel in years. What a treat! 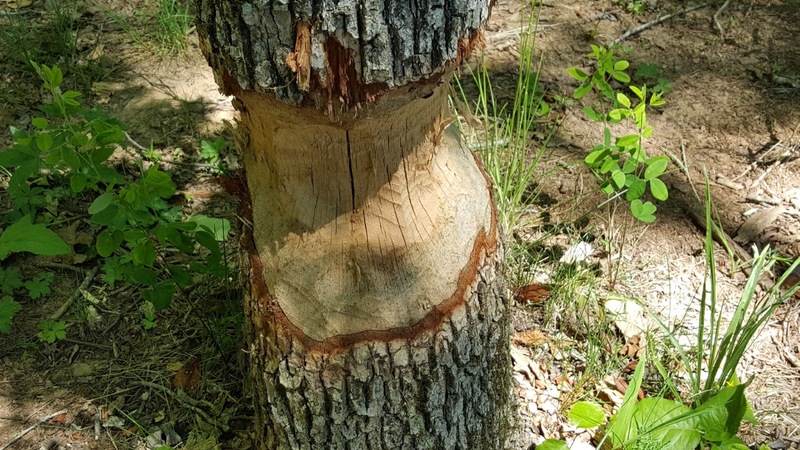 signs of recent activity on these trees. What do you think Alison? Maybe they headed your way to meet up with yours on the lake. 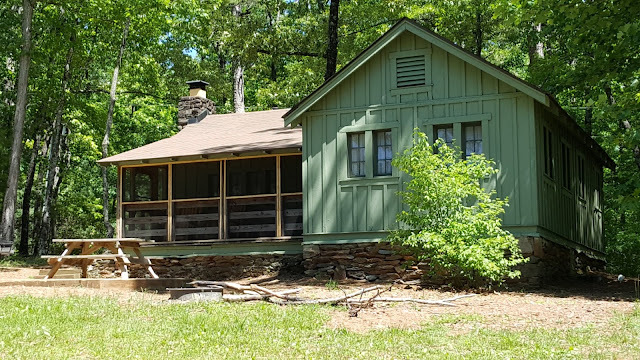 A cabin for rent. There are a number of these with lake views available to rent in the park. They all have a porch, wood fireplace, heat pump, a picnic table, and an outdoor fireplace. 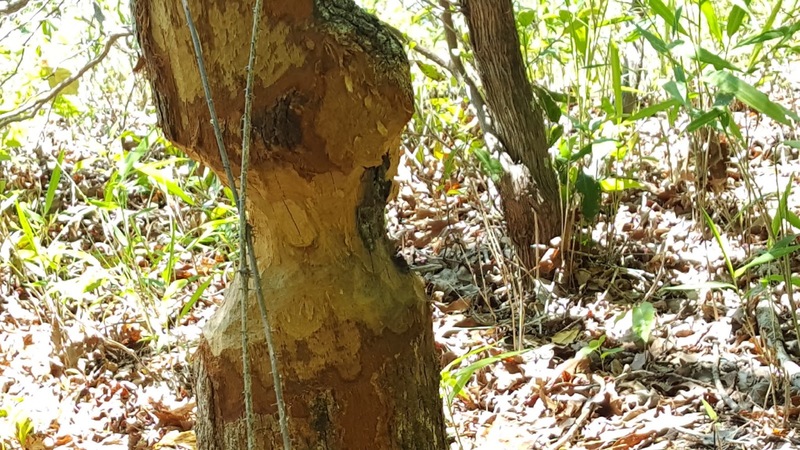 Not Florida , for sure! We follow Route 107 north to Route 130 South again to Route 11. 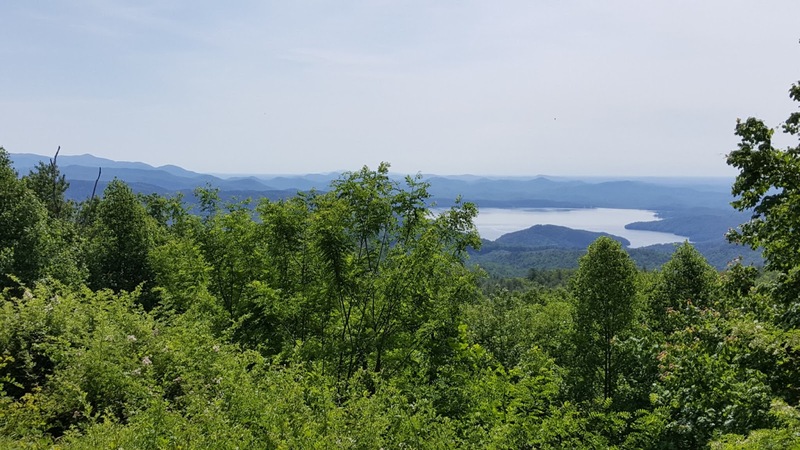 This is a scenic route that is a little bit of a challenge, but offers great views. 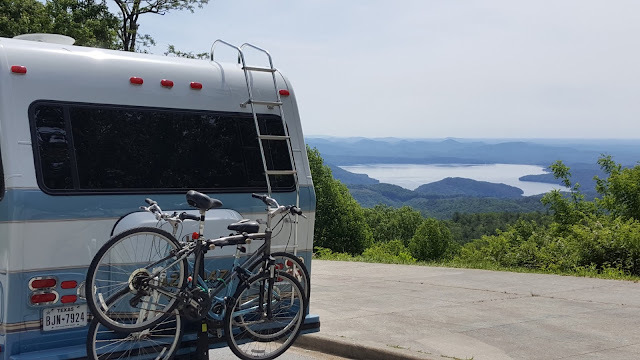 A little hint of the Smoky Mountains on the left and Lake Jocassee below. 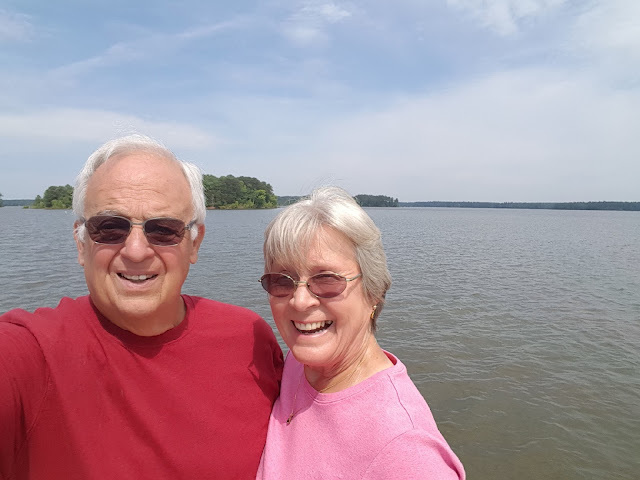 Back on Route 11, Jan and I take a few detours into Devils Rock State Park and here at Table Rock State Park. There were some nice hiking trails here with views, but we decided to move on to Kings Mountain State Park. 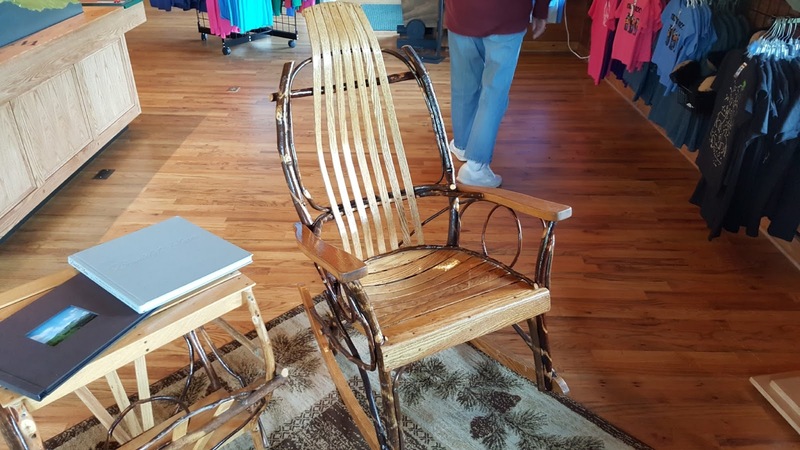 We did like this wooden rocking chair in the visitors center. It seems a nice use of bent wood on the frame , seat , and back. We follow Route 11 to Interstate 26 south to Interstate 85 east to Kings Mountain National Park and State Park Campground. We recommend the visitors center for a very well made movie about the battle that turned the tide for the Patriots in the Revolutionary War. Also , a well designed walk through the battlefield that lets you envision what the battle might have been like. 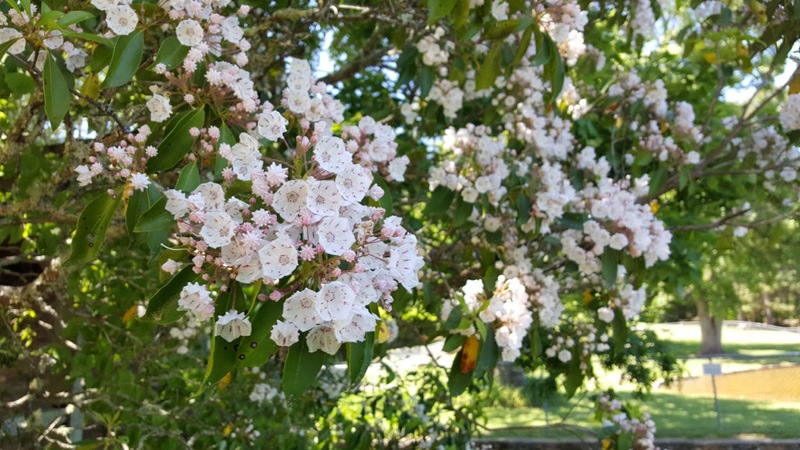 Great photos, thanks for the share!